Guinea pigs are generally healthy when they receive good care and nutrition. To have happy and healthy pets give them a proper diet, fresh water, and a clean, safe habitat with toys for exercise. 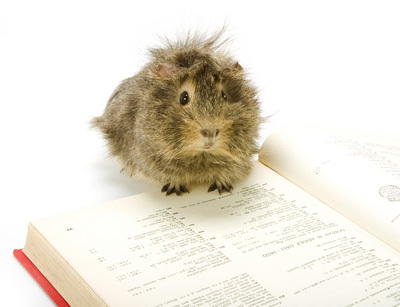 Unfortunately, even with all these things sometimes a guinea pig may become ill or injured. When a cavy is ill, it becomes very fragile and its health can deteriorate rapidly. General signs of illness are hair loss, weight loss, panting, sneezing, wheezing, coughing, discharge, diarrhea and seizures. A sick pig is quiet, listless and dull. He may sit hunched up in a corner away from activity, people and cage mates. In the event of illness or injury, contacting your veterinarian is always recommended. Below is a list of some of the more common illnesses. Guinea pigs are not aggressive, but if a confrontation does occur bite wounds can be serious because of their long, sharp teeth. You can clean the area with a mild antiseptic and if the wound becomes swollen, red or shows any other signs of infection or abscess call your veterinarian. Inflamed feet is caused by using wire mesh flooring or abrasive bedding material. This is very painful and your pet may be reluctant or unable to walk. He may cry out in pain and lose weight due to lack of appetite. This is a serious condition that can lead to death. Pneumonia which is caused by a bacterial infection is the most common cause of death in cavies and symptoms may include wheezing or sneezing. Small stones can form in the bladder or urethra and obstruct the outflow of urine. These stones are very painful and surgical removal is usually necessary. Parasites, bacterial and viral infections, improper diet, stress or unclean cages can all cause gastrointestinal problems. These issues may cause diarrhea, constipation and bloat. Bloat is a medical emergency that is very painful and rapidly results in death. Signs of bloat are rapid heart rate, difficulty breathing, lack of appetite, inactivity, extreme pain and a distended abdomen filled with gas and fluid. Guinea pigs can get cataracts and pink-eye, but humans can not contract pink-eye from them. Eye injuries from sharp objects or bedding in the cage are other possible problems. Ear problems may be caused by infection, injury or parasites. Scratching at the ears, head shaking, tilting his head to one side or a loss of balance are all symptoms of a possible ear problem. A common problem is when the incisors or molars of your pet do not grow straight. The teeth will not wear evenly, and may even grow into the roof of the mouth or cheeks. The teeth will need to be trimmed or filed back by your veterinarian. Do not leave your guinea pigs’ cage in direct sunlight, in your car, in an unventilated room, or in temperatures above 75 degrees. Symptoms of heatstroke are heavy breathing, laying on the belly, and even unconsciousness. If you find your pet with heatstroke, remove him from the area and submerge his body in cool, not cold, water. Give him fluids and contact a veterinarian.